Wanyu Sung spent her summer working on energy and water metering strategy for adidas Group suppliers in China. The adidas Group enlisted Wanyu Sung to build a clear business case for energy and water metering. She was also asked to identify the opportunities and challenges that its apparel, textile, footwear and football suppliers had encountered. Sung developed multiple engagement strategies based on where suppliers were in terms of implementing smart energy and water management. For suppliers seeking to initiate their sustainability campaign, she designed a reporting tool to help streamline the data gathering process. For suppliers contemplating smart meters, she proposed a new valuation method to better assess the profitability of a smart meter project. Then, for suppliers seeking to maximize the value of their smart meter systems, she created an industry-specific set of guidelines to help factories leverage their data. 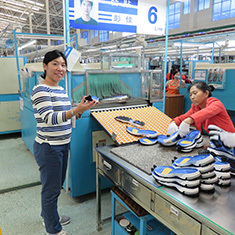 As the adidas Group continues to expand this metering initiative, Sung’s findings could be incorporated into communication materials that engage more suppliers with different products. This is a scalable solution, and Sung’s tools could be leveraged across the adidas Group supply chain. Wanyu Sung is pursuing a Master of Environmental Management degree at the Yale School of Forestry and Environmental Studies. Prior to Yale, she worked at Ministry of Economic Affairs in Taiwan where she organized trade missions and assisted over 70 green manufacturers with maximizing their global export potential.